E.U. took the lead, not USA. 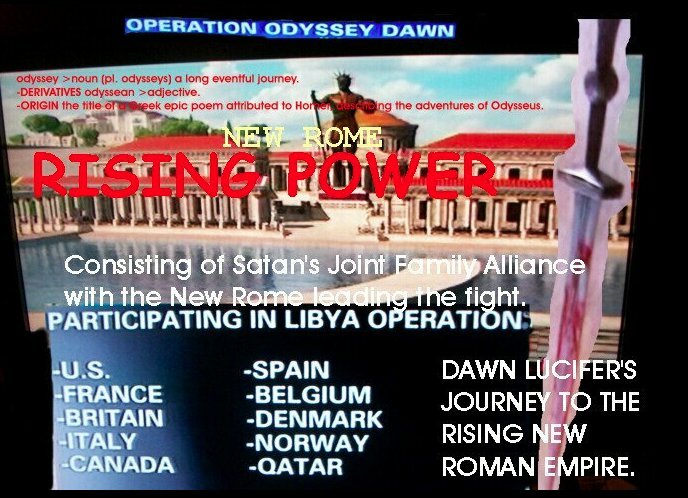 The world’s jigsaw puzzle, involving all of the intelligent creations, and with France whom is a dominate military power for the New Roman Empire – consisting of the European Union’s family making up the New Rome – and the United States being in the background and backing the New Rome as the Beast that is falling from power, you can piece the jigsaw puzzle together as things are now taking or falling into place piece by piece. Know this children: All things, including headlines, spoken words, numbers, sounds – regardless of what makes them, they are all part of the puzzle that brings forth the answers to what is happening. As an example, Reactor 3’s failure in Japan signifies Yahweh’s unified effort of the LOZ to continue the dead zone of Japan. Everything presently going on in the visible material realm is an intricate piece of the puzzle that ties in and fits in to what is the over all picture of the rise and fall of Dawn Lucifer Satan the Devil’s adventures over the last 6000 years of his rule. He is copying the LOZ by forming a joint alliance that prospers his rising power in quest of world dominance. All things reflect other things. Each county that is rioting against their rulers and wanting change of government reflects the individual fall of each nation on this planet as Christ’s kingdom draws ever near to coming into full power.